Attention NYC Moms and Moms to-be - this is the can't miss event of the season! 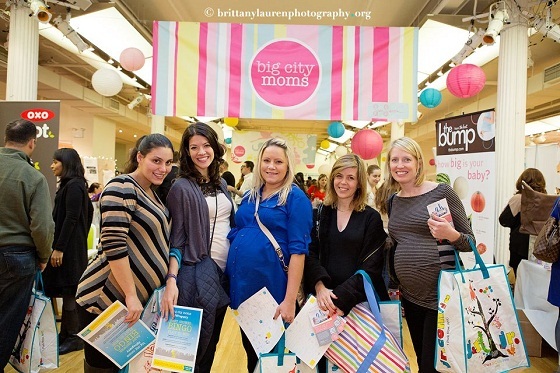 Big City Moms Biggest Baby Shower Ever event is like no other baby shower you've ever seen! With over 100 of the best companies in the baby industry, it's a one stop shop to test out, touch, feel and get educated on everything you can possibly need for your growing family. Enjoy mingling with other expectant and new parents while you enjoy sweet treats, mocktails and more - in the elegant setting of the Metropolitan Pavilion. Pregnancy and those early months of motherhood are joyous but they can certainly take a toll on mom- so how about some much-deserved pampering? Style experts will be on hand to help moms and moms to-be look their best and get that "pregnancy glow"...take a load off and relax with a massage or two with leading skincare lines. Pregnancy cravings have your taste buds in a frenzy? Big City Moms has thought of it all - Enjoy sweet treats including frozen yogurt, cake pops, and more. Plus, sip the Big City Moms signature mocktail! Having heard fabulous things about this event, I am thrilled to experience it first-hand next week - Keep an eye out for our upcoming coverage of Big City Moms Biggest Baby Shower Ever event. The Spring 2013 Big City Moms Biggest Baby Shower Ever will take place Thursday, May 30th at The Metropolitan Pavilion from 6:30pm-9:30pm (Super Pass entry is at 5:30pm). With events - big and small and everything in between, Big City moms is the destination for moms, moms to be and families. Big City Moms is the premiere social event group in NYC and NYC moms rely upon Big City Moms as their #1 resource. From seminars, family fun days, mommy and me classes, expectant events, Big City Moms is the place to be all over the city. Founders, Risa Goldberg and Leslie Venokur are sisters as well as Big City Moms themselves. Risa is the mom of a 9 year old daughter - Hallie, and 5 year old twin boys Cooper and Harrison. Leslie is the mom of a 4 year old daughter, Samantha and a newborn boy, Max. Big City Moms was created almost 10 years ago with events geared towards working moms. Since their inception, Big City Moms has evolved to cater events towards all moms, moms-to-be and the entire family. Today, they have a network with over 100,000 mothers, an online community and events every day across the Unites States.